Select one of 4 standard Colors: Gold, Silver, Black or White. Write in your Other Imprint Color request in the text box for the imprint above, or when emailing over your artwork logo. Please select the quantity of an item to be imprinted. **NOTE: If your imprint is new, you will need to purchase and imprint set-up. ***If it has been more than 2 calendar years since your last order of previous imprint artwork, you will be charged for a new imprint set-up. We only hold imprint plates for 2 calendar years since their last use. New Set Up + Typesetting &/or Standard Artwork = You will either have Radex typeset lettering/copy for your imprint, or convert a logo or art element that you email in" - The $60 covers the imprint plate set-up, and most (90%) of basic typesetting and artwork adjustments to convert your artwork to Black and White vector art needed to make the imprint plate. New Artwork: Please write EXACTLY what you would like typeset in the text box below. If you have a logo, note that in the text box and email your logo to: art@radexinc.com with your online order number in the subject line of the email. For Imprint RE-ORDERS: Please write which on-file artwork (used within the last 2 years) you would like used on your order. ***We will email you an Artwork Imprint Layout Proof for your approval before production on all online Imprint Orders. 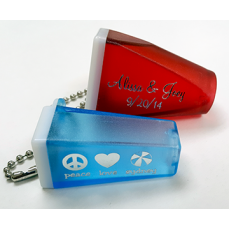 Custom hotstamp imprint added to purchase of matching product.